Your website is hosted on a type of computer called a server, which publishes all of your website pages, images and content, to visitors to your website. When you register a domain name, there is facility to route the domain name traffic to the server, which then holds all of the files, graphics and content, that make up your website. 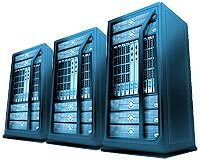 Your website host is also the same location where e-mail addresses and databases are held and managed from. Scotland Web Design offers a range of website hosting facilities that are specifically catered for individual customer requirements. Those services also include any databases that will run your Content Management Systems, blogs or shopping carts which form the basis of your website, as well as, the e-mail addresses that will form a key point of contact for your business or organisation. Website hosting prices start from £80 / year.